The photograph to the left, of the National Community Christmas Tree in Washington, D.C. serves as an excellent entry point into describing this chapter. The tree shown is being erected in 1938, when the movement for community Christmas trees was in full swing. The idea was not to have simply a national tree, as is White House custom now, but to have the National Community Christmas Tree be a symbolic centerpiece of thousands of other Christmas trees decorated in town squares and other public spaces across the nation. Supporters of these Community Christmas Trees reasoned that one per town would alleviate the need for Americans to cut a tree for their living room every December, a practice many conservationists considered wasteful, among them J. Sterling Morton, the founder of Arbor Day. More importantly, Community Christmas Trees would also exercise the use of public space, strengthening local communities, many hoped. Despite these dreams, however, Americans increased consumption of private household Christmas trees after World War II. The most commonly shared trees were those at the mall. Today, when Americans consider Christmas trees, they often face a decision much different than choosing between public and private space. Frequently, they decide whether they want a “real” or “fake” tree. However, the framing of authenticity against artifice, this chapter shows, is founded upon that earlier concern about public versus private space. It’s the story of the Christmas tree industry that makes the connection. Christmas trees require work, agricultural landscapes, and marketing to find their way inside the home. The photograph above reminds us of this need for work. 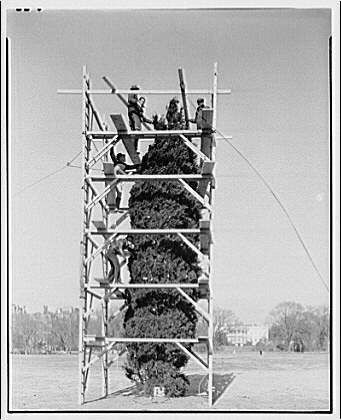 The men atop the scaffolding are getting the tree just right for display, one task of many that went into making Christmas trees. The work began on hundreds of Christmas tree farms, which increased during the industry’s boom era of the 1950s and 1960s. Often seeding otherwise marginal land (the cut-over districts of the Upper Midwest and the uplands of North Carolina, for example) Christmas tree farmers organized the National Christmas Tree Growers’ Association to market their trees. In the 1980s, after thirty years of advertising campaigns emphasizing visual aesthetics and other qualities, the organization launched its RealTree campaign, the first to frame consumer choice as a decision between “real” or “fake” trees. Americans are accustomed to using nature as a way to parse artifice and authenticity, and the RealTree campaign was no different. However, by looking deeper into the Christmas tree’s past, to the pre-war Community Christmas Tree movement, we can see that the choice between “real” and “fake” rested upon an earlier narrowing of options: choosing private consumption, postwar Americans turned away from public space. This chapter places this story within several overlapping contexts, from the history of American timber cutting to the maturation of the Christmas tree industry, and from the history of American consumerism to the social production of residential, commercial, and symbolic landscapes.